New this year is an inflatable fender I first saw in Titusville that a neighbor had. They can be rolled up and stored without taking up much room and can be absolutely essential in a storm. The one I bought was 12 inches in diameter and 5 feet long. It was the heavy duty version. If you're cruising the ICW, get one of these fenders! The other ones I have look flimsy by comparison. Practical Sailor rated them number 1. Don't think about it, buy one. It's going to be a long night. I think we're secure and with the wind predicted to clock around from the south to the west and then out of the north, it's the best direction we can have. We are only exposed to a small area to the east. 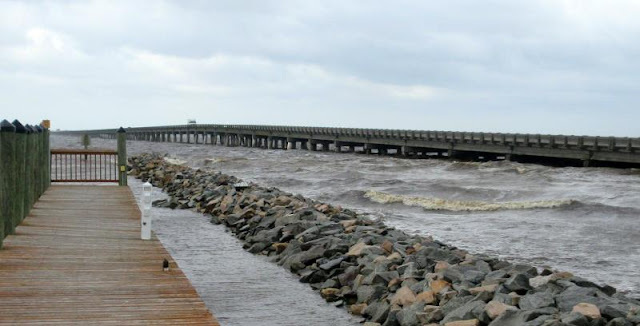 There are two long jetties leading into the marina and not much gets in from the river. I'll monitor the wind change tonight but we ought to be okay. Our next stop is RE Mayo but we don't know yet our day of arrival. It could be Saturday or Sunday, depending upon the weather. The winds are due to abate by noon Friday but that may be too late to leave Alligator River, we'll see. Watching carefully from Solomon’s. Don’t want to get into Carolinas too soon. This is a beautiful place to hang out though. Janice, are you at the Holiday Inn anchorage? We anchored there for one night, went to Spring Cove Marina firv2 during the storm and are anchored again. Might stay until Sunday cuz the forecast for tomorrow doesn’t look good and we’d like to get to Fishing Cove. PLUS-we are in love with these condos-we might take a look at one tomorrow. Always thinking!! We LOVE. This place! What is the brand of that inflatable fender you have there ? 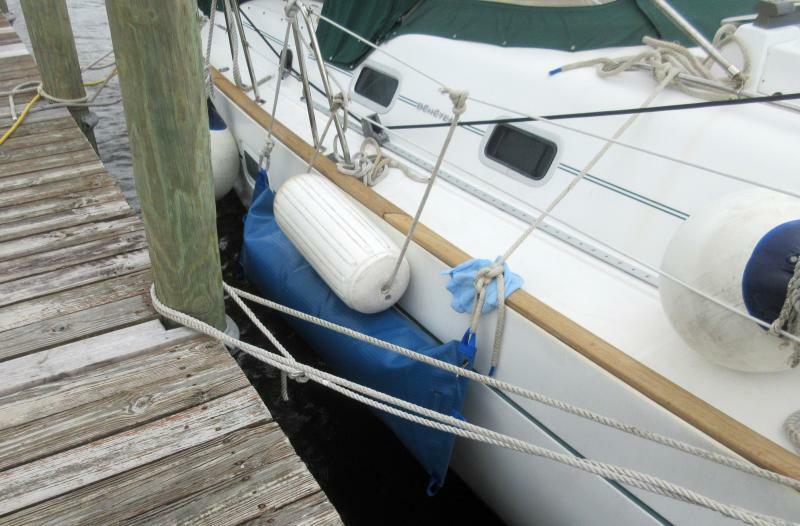 - they added large patches on the aft tubes to provide protection from boaters pulling their dinghy up on sand when beached. - the tube to transom attachment points are heavily reinforced with a thick rubber mold. - it's made in the same factory in China as Mercury and Zodiac inflatables. - it comes with a pump that has a pressure gauge so you know how much pressure you’re adding. - the three air chambers have over inflation relief valves so you can’t over inflate Ben if the sun comes out after a morning inflation. My previous inflatable by AB had none of the above features. - two tow rings attached to the inflatable part, port and starboard. - a seat comes with the dinghy and the Defender has attachment for a second seat. - AB had a double floor so it’s completely flat, the Defender has a single floor as do almost all new inflatable models. It’s flat enough for me. The Defender model is about $1500:less than AB and about $500 less than equivalent models from Mercury and Zodiac. You would not believe how it comes packed. It’s crated with furniture grade wood (to pass European requirements, no insects). The dinghy is hung by straps inside the crate so it doesn’t run, it’s encased in plastic and bubble wrap. Then it’s also inside it’s own firm fitting dinghy cover with a zipper. Once out of that, there a big plastic bag that has to be removed. I’ve inflated it once in the summer, zero air loss, I’m happy. I can plane with a 5 ho motor with Hoolie aboard.